I spent three fabulous days printing a copper drypoint on woodcut prints. Ellen Heck was an excellent instructor: enthusiastic, nonjudgmental and fun. I learned at least three techniques I didn’t know before and will now use all the time. I was also happy to be working alongside some of my very best friends. For my image, I chose a photo of my son, Owen, when he was 3 years old visiting the Santa Barbara county fair. 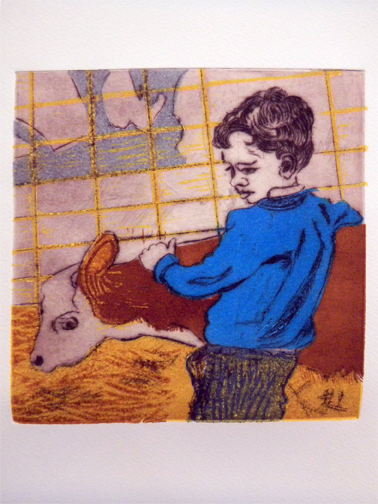 I printed the image in slightly different colours, changing the calf in two versions to bright blue. Thanks, Kathy, for your kind words. 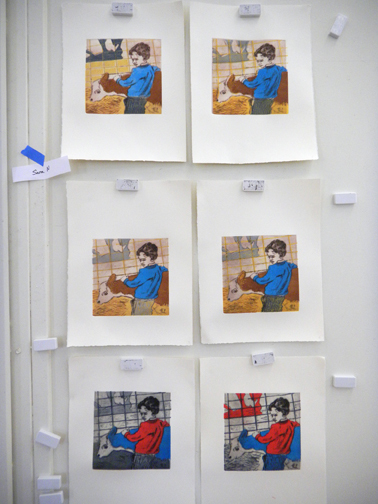 The process Ellen taught was to make the copper dry point first, transferring our picture using the grid method. 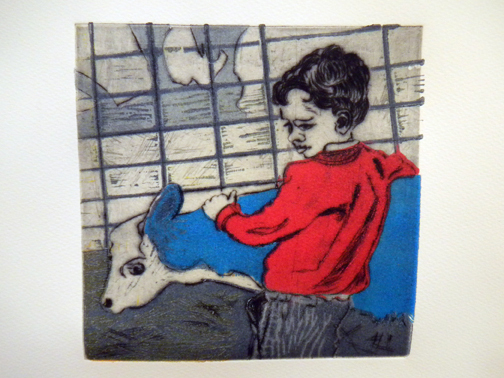 We then printed the drypoint on damp paper and immediately printed the wet paper print onto the woodblock. Registration was set up ahead of time. Having the dry point drawing on the woodblock told us exactly where to cut the woodblock so the shapes would line up later on the print. Once the woodblock was cut we printed it, let it dry, resoaked the paper and printed the dry point on top of the colored print. It is a very nice technique.